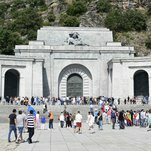 MADRID — The Spanish Parliament voted on Thursday to exhume the remains of Francisco Franco, the former dictator, from the underground basilica that he had built near Madrid, intensifying a debate over his legacy that continues 43 years after his death. Parliament approved the exhumation, 172 to 2, with 164 abstentions, and the two who voted against were reported to have done so in error. The two main center-right opposition parties refused to take part in the vote, and the conservative Popular Party plans to appeal the decision before the Constitutional Court, arguing that Prime Minister Pedro Sánchez unjustifiably fast-tracked the measure. Mr. Sánchez, a Socialist, promised the exhumation soon after becoming prime minister in early June, having ousted Mariano Rajoy and his Popular Party from power in an unexpected vote of no confidence in Parliament. It is not clear where Franco’s body would be reburied. The debate has also heightened public interest in the Valley, which welcomed more thanover 60,000 visitors in August, a monthly record. Among them were people who came to pay homage to the dictator and to give a Fascist salute before his tomb. Mr. Sánchez has promised to revive the law, which had been deprived of state funding under Mr. Rajoy’s conservative government. One of the measure’s main goals is to help finance the opening of more than 2,000 mass graves across Spain, which date from the civil war. Mr. Sánchez leads a fragile government that controls only a quarter of the seats in Parliament, but on Thursday he received support for the exhumation from the leftist party Podemos, as well as the Basque and Catalan nationalist lawmakers who helped him replace Mr. Rajoy in June. In fact, a Catalan party, Esquerra Republicana, wants the Socialist government to go further and annul the court rulings of Franco’s regime, many of which were decided by military tribunals. The Catalans particularly care about restoring the name of Lluís Companys, the Republican leader of Catalonia, who fled Spain at the end of the civil war. The German Gestapo captured him in France and returned him to Barcelona, where he was sentenced to death and killed by a firing square in 1940. Shortly after winning the civil war, Franco ordered the construction of the immense basilica of the Valley of the Fallen to be carved into a mountainside northwest of Madrid. Construction lasted 18 years, with Republican prisoners among the labor force. The basilica is now run by Benedictine priests who live in an adjacent abbey. After taking office, Mr. Sánchez met with Cardinal Ricardo Blázquez, who leads the conference of Spanish bishops, to ensure that the Church would stay on the sidelines of the debate over Franco’s remains. But relatives of Franco have opposed the exhumation and could still appeal Thursday’s decision before the national court. Those opposed to moving Franco’s remains say that he and his history are no longer on the agenda for most Spaniards, and they accuse Mr. Sánchez of using the exhumation question to reinforce his left-wing leadership and credentials. In a nonbinding vote in Parliament last year, the Ciudadanos party backed the idea of moving Franco’s corpse to a different burial site. But since Mr. Sánchez took office, the party has changed tack, claiming that Mr. Sánchez is unnecessarily reopening old wounds. Lawmakers of the party abstained in the vote Thursday. Franco died in 1975, which means that most Spaniards are too young to remember his regime, let alone the civil war. But Spain has stood out in European politics recently for not having a far-right party make significant headway in elections. Mr. Rivera of Ciudadanos suggested that Franco’s burial site could be turned into a national cemetery, “like that in Arlington” in Virginia. But Joan B. Culla, a Catalan historian, said in an interview that the Valley of the Fallen could not be compared with Auschwitz or Arlington. He suggested the site could be transformed into a memorial resembling the giant Douaumont ossuary at Verdun, where the French and the Germans fought one of the bloodiest battles of World War I.